One of the most important benefits of digitization is the ability to capture and analyze data and to derive business value and profitability from that data. However, until recently, only a small percentage of the data generated within organizations has been captured and exploited to drive business value. Forrester reports that between 60 and 73 percent of all data within an enterprise goes unused for analytics. Even in today’s new era of digitization and the Industrial Internet of Things (IIoT), where more field devices than ever are producing even more data, most businesses are challenged in their attempts to extract, understand and take meaningful action based on this new data. Major obstacles such as lack of openness of hardware technologies, proprietary software and the cost and complexity associated with mining and interpreting data have held many organizations back from making progress in this area. In addition, most major automation technology suppliers have been using a multitude of different, incompatible ethernet protocols, which has incited what has come to be known over the years as a “field bus war.” Since most end users rely on more than just one automation supplier to build a solution, the need for cost effective interoperability and integration is acute. Fortunately, some major progress is being made to standardize interoperability of the various ethernet protocols through expansion of what is called Open Platform Communication Unified Architecture (OPC UA) and the expanded use of Time Sensitive Networks (TSN). OPC UA is a machine to machine and OT to IT communication protocol designed specifically for industrial automation. TSN is the IEEE 802.1Q defined standard technology that provides deterministic messaging on standard Ethernet. TSN was developed to provide a way to ensure information can travel from point A to point B in a fixed and predictable amount of time. This predictability enables increased efficiency. Major global industrial automation technology providers have been leading the charge for enabling an ecosystem that facilitates collaboration in an open environment. Because of the strength of OPC UA to both access and interpret data, the goal is to rapidly spread the deployment of OPC UA. In this way, the industry can use a universal language across all the areas of the automation pyramid (a framework that links field level, control level, supervisory level, planning level and management level data). OPC UA can then provide the networking framework that supports the expansion of Industry 4.0 / IIoT. Progress has been made at the control level and upwards where OPC UA has already been successfully tested and implemented in the field to address machine level and process level interoperability. The protocol has been adopted among various automation suppliers and both OEMs and end users benefit thanks to significant time savings associated with data communications interoperability. 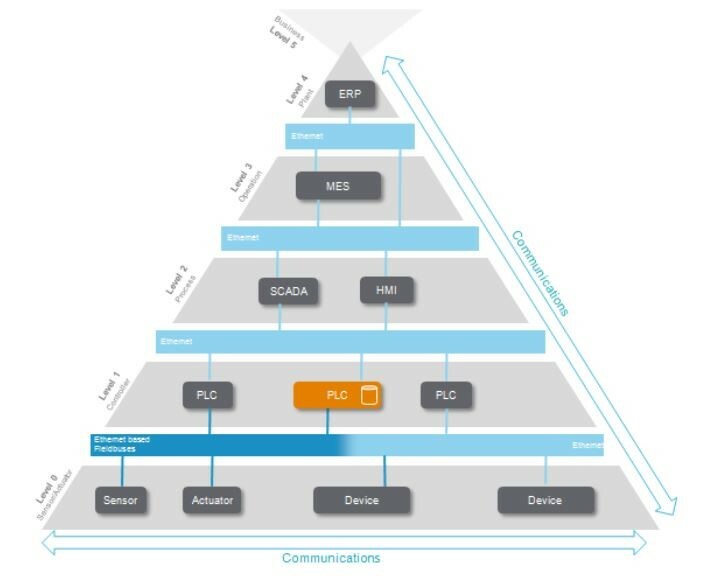 Now the industry’s attention is turning to more robust and open communications from the controller layer down to the field device level (like sensors and actuators), where much of the valuable data is trapped in silos. All major automation suppliers have agreed to support the OPC Foundation sponsored field level communication (FLC) initiative to converge and put an end to the field bus war. This initiative goes beyond just exchanging data between different types of automation equipment, it will also standardize the way in which automation devices and actuators are configured, diagnosed and managed. Companies like Schneider Electric are helping OEMs and end users to recognize the value of the new OPC UA and TSN standards with its open EcoStruxure Plant & Machine architecture. 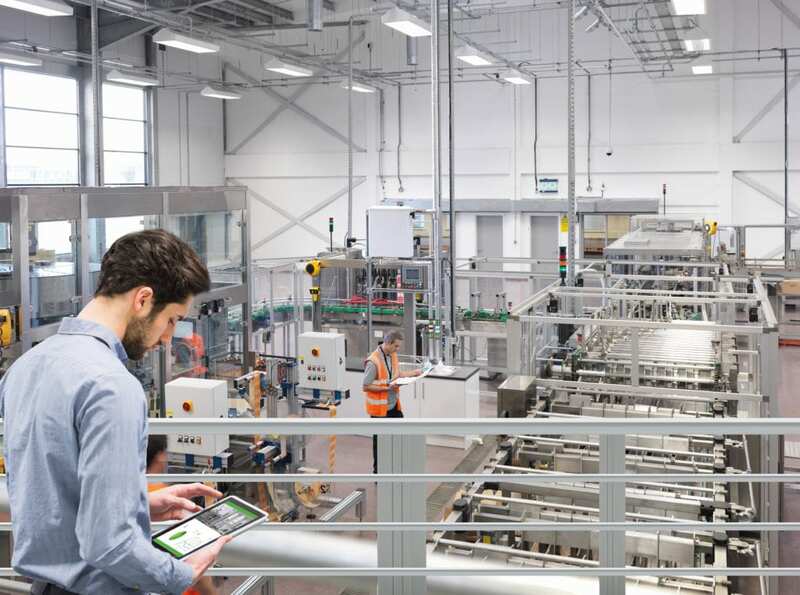 The EcoStruxure framework enables smart machines, regardless of automation manufacturer, not only to talk to each other on the floor of the factory, but also to communicate to humans at the operation and management levels of the plant via dashboards. A machine can also communicate knowledge about itself. It can answer questions like: Where is the machine located? What is the status of the machine? What is the status of its parts? Is a motor about to fail? This machine self-awareness is provided to the cloud and enables operational analytics so that faster and more accurate decisions can be made and new levels of productivity can be reached.